It may be August already, but summer in the city is only hitting its stride. Summer in Portland is always the best time of the year here. The days are long and almost invariably sunny. Not to mention, the city comes alive with all different kinds of events both intimate and festival-sized. 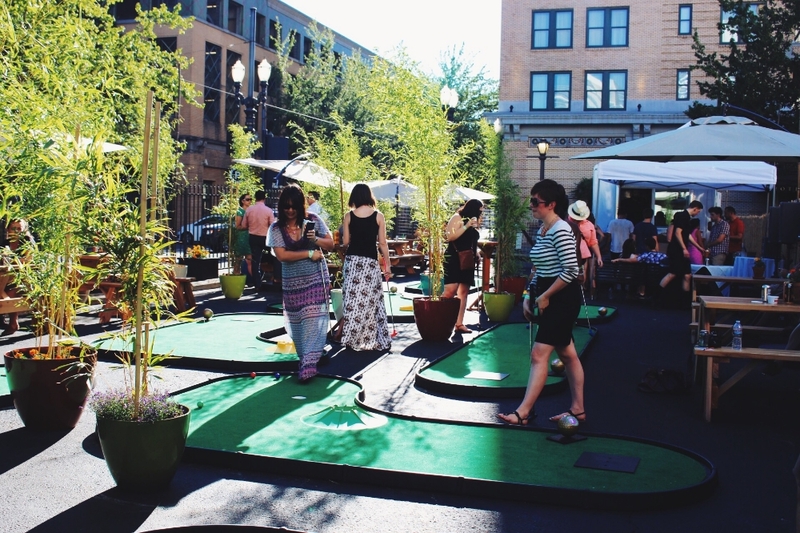 Whether your idea of a perfect summer night is dancing away by the waterfront while listening to hot alternative bands, shopping for the latest sustainably designed local goods, or simply playing a few holes of mini golf with friends and a craft beer in hand, there is truly something for everyone in Portland. VSCO Cam x Artifact Uprising hosted a book signing for professional iPhone photographer Kevin Russ' beautiful collection of outdoors photos at Barista on NE Alberta. Canon cameras hosted "Canon Bring It!" at Doug Fir Lounge that included camera and lens test drives at interactive photography stations. Enjoying a pretty summer night and free live music at the 35th annual Cathedral Park Jazz Festival. 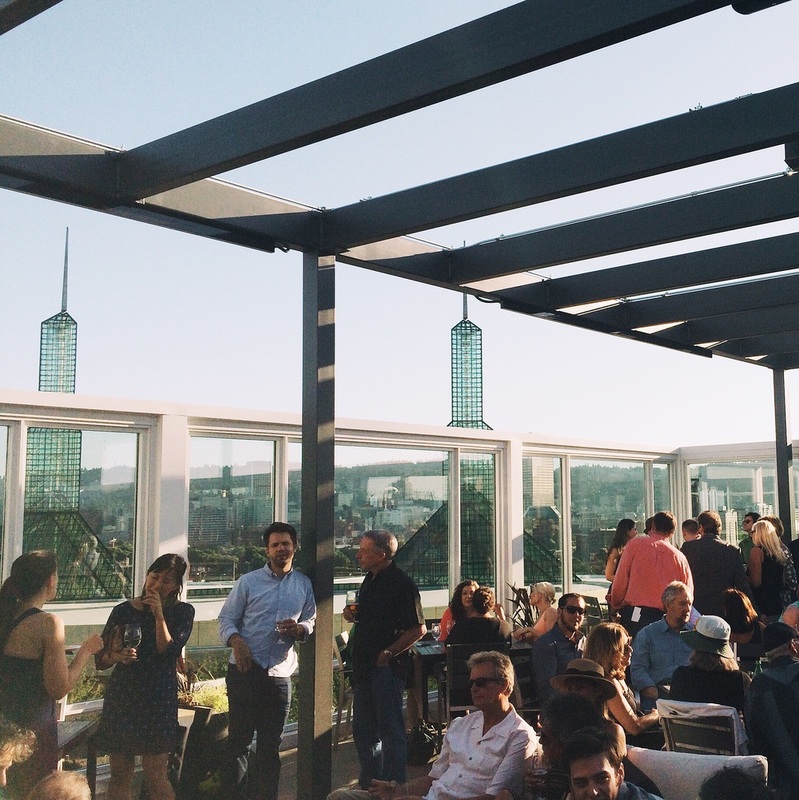 Celebrating in style on the rooftop of Altabirra for Hotel Eastlund's Grand Opening Gala. Teeing off on the corner of SW 15th and Yamhill, The 19th Hole is a new 9-hole mini golf pop-up from the Hotel deLuxe team. Gracie's Chef Mark Hosack serves gourmet food cart fare alongside local beers, wines, and ciders in true Portlandia fashion. Mini golf is $6 per person, per round. Be sure to double check The 19th Hole website if playing in August as a few dates are reserved for private events. Portland's musical event of the summer, Music Fest NW, kicks off at Tom McCall Waterfront Park on Friday, August 21st. Not-to-miss headliners include Foster the People, Misterwives, Beirut, Belle and Sebastian, Modest Mouse, The Tallest Man on Earth, and more. General admission and 3-day passes are available online. 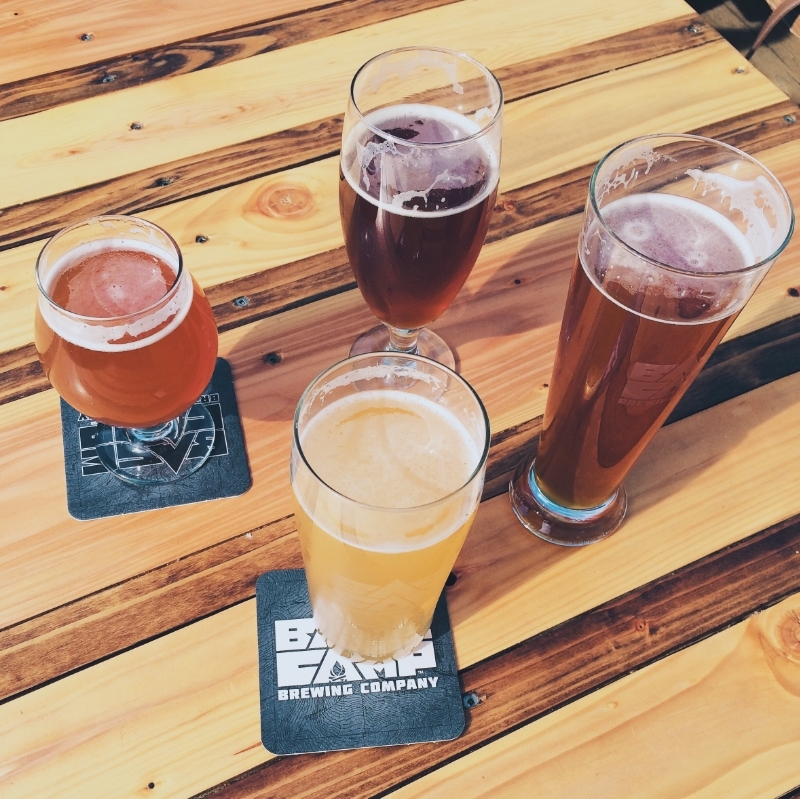 The craftiest of craft brews from Base Camp Brewing Company. It's a short field trip to Oregon's capital city for Pairings! The celebration of the best craft beers, wines, and dishes kicks off the 150th Oregon State Fair in Salem on August 21st. Stroll through the 2-acre gardens before the fair and nibble on delicious bites from local restaurants, breweries, and wineries such as Base Camp Brewing, Willamette Valley Vineyards, and more. Tickets are $35 per person, and guests of Pairings! will receive free entry to the Oregon State Fair running August 28th - September 7th. 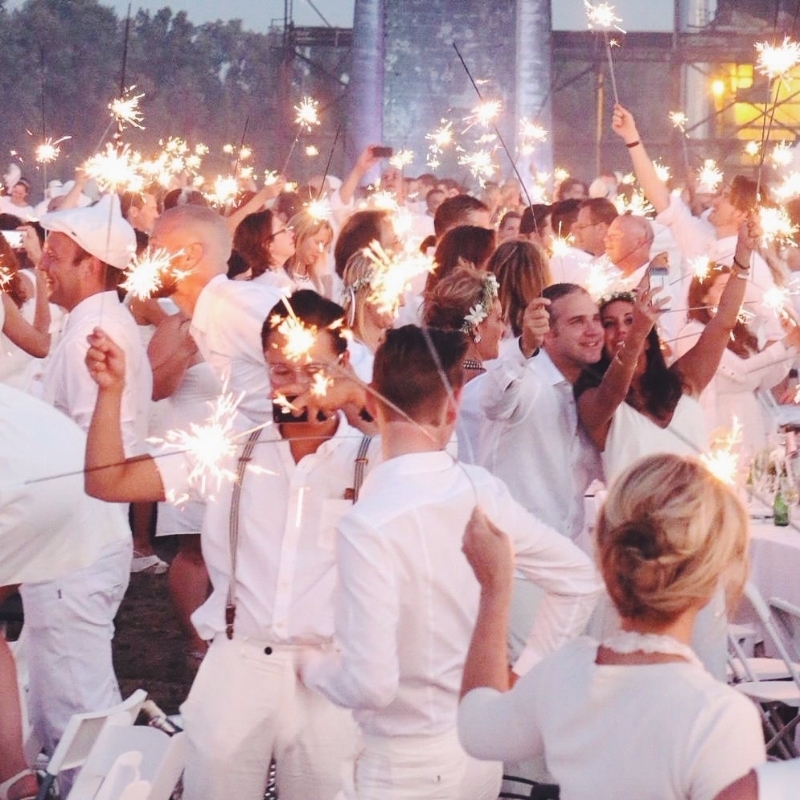 Sparklers light up the night at last year's Dîner en Blanc on the waterfront. Mysterious and elegant, this August marks the 3rd year of Portland's ultimate picnic. Guests create their own picnic basket, dress to the nines and gather at a secret location for a pop-up summer dinner party. This year's date is to be determined but tentatively penciled in for August. Keep a close eye on the Dîner en Blanc - Portland Facebook page for updates. la bella vita. Held at Pioneer Courthouse Square, the all-ages summer festival will feature favorite Italian dishes and drinks accompanied by live music and dancing. Pop-up art galleries, speaker events, and Italian film screenings are also set to occur throughout the week. Admission to Festa Italiana is free. Sustainable design meets shopable street fair at the Urban Air Market on Sunday, August 30th. Over 100+ cutting edge designers, musicians, artists come together in the streets of Portland's Pearl District for a day featuring the area's best innovative creations. Tickets are free and currently available on EventBrite.